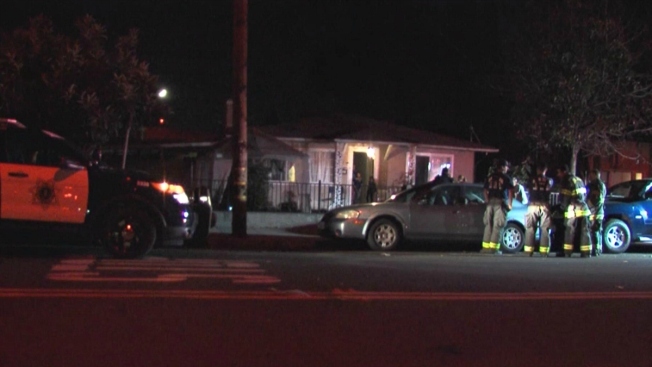 A San Jose family described is shaken up after someone threw three Molotov cocktails at their house on Thursday night. Carlos Gonzalez, one of the victims, said the suspect or suspects filled bottles of a Mexican soft drink with a flammable liquid. Two of the weapons exploded, but the third is now in the hands of investigators. Fire crews responded to the house fire, which Fire Capt. Mitch Matlow later described as "very suspicious in origin." The call came in around 9:30 p.m. Thursday on the 900 block of North 17th near East Hedding Street. On Friday, Gonzalez was still stunned as he described the scene outside his house. "It was pretty scary," he admitted. "When I saw the flames, I thought the house was on fire." Gonzalez said he quickly grabbed a garden house to douse the flames. Video shows a mother in pajamas and two children standing in the doorway of the house. Also, it appeared as though the fire had been contained to the base of the house, near a door and concrete path. No one was injured. "The kids could have gotten hurt because they were the ones by the living room," Edith Gonzalez said. "So they were the only ones playing, so it was really, really scary." Along with the couple and two children, Edith Gonzalez’s elderly parents also live in the house. The family has no idea why someone would target them because they’ve never had enemies in the 20 years they’ve lived there. "For someone to do something like this, that person’s got to have some serious problems, to the point he wanted to burn a house knowing that there’s people inside the house," Carlos Gonzalez said. A man named Miguel told NBC Bay Area he witnessed a "guy at the corner of the house" who swung his arm and then "just bolts down the street." Matlow would not comment on whether the suspect possibly threw an incendiary device at the house. He referred all questions to San Jose police, who were seen investigating the scene. Police Sgt. Enrique Garcia, however, referred all calls to the fire department's arson unit. An investigation is ongoing. Officials hope to get their hands on neighborhood surveillance video and figure out a motive for the attack. They have warned the Gonzalez family, however, to be very careful because the suspect or suspects might return. Family members said they didn’t sleep the rest of Thursday night and worry that Friday night might bring more reasons to be afraid.